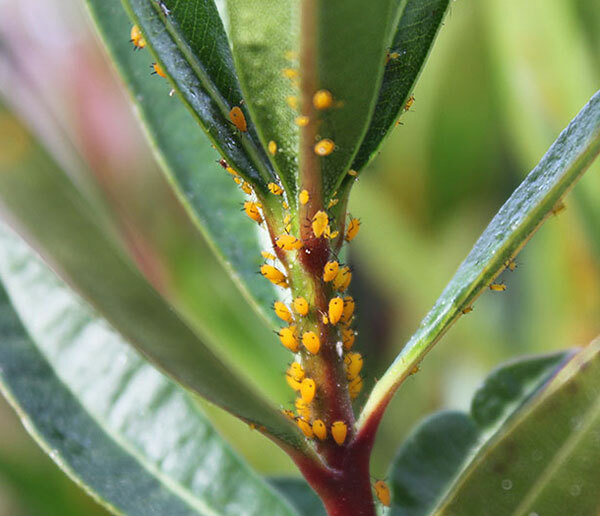 The oleander aphid or the milkweed aphid (Aphis nerii Boyer de Fonscolombe) is the small, little insect, seen in clusters on oleander leaves. They are bright yellow with short black legs. They don't look like an insect at first. They appear to be blobby spots of pollen or seed clusters, but upon closer inspection, they'll move with the wind and their legs will jiggle. This is how I found them. If you see dark brown ones, that's mostly like a host of a parasitic wasp or other such creature that has deposited an egg in the aphid for the aphid to be consumed or turned into a zombie. They're most commonly found in Florida or any warm or tropical climate. In my case, it's the desert heat of Nevada where oleader is very popular. This is an asexual pest. In this instance, most of them are female and do not need a male to reproduce. They can be winged or wingless. Where did it come from and why is it here? It's most commonly found in Florida or any warm or tropical climate. 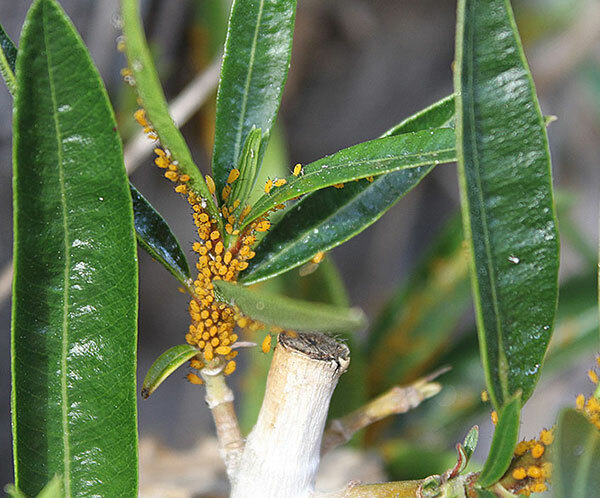 This pest probably originated in the Mediterranean and has traveled with oleander through the distribution of the plant, although no precise origin has been determined. They feed on the juices produced by the oleander plant. They love the fresh new shoots of the plant. They can cause harm to new growth. Leaves can become faded or distorted. They leave behind a sticky dew that attracts ants. The sappy liquid that they excrete can mold causing issues with the host plants photosynthesis. I found in one article that it can effect citrus. Since I have 2 citrus trees in my yard, I'll be keeping an eye on them. Sometimes this aphid will transmit viruses to your plant like sugarcane mosaic potyvirus or papaya ringspot potyvirus, but I haven't seen many cases on the web. What about other plants besides Oleander? The aphid has been known to infest vinca, aka periwinkle. They've been known to feed off of milkweed which their nickname implies. In rare instances, the insect can feed on Hoya. Repeatedly knocking them off the plant with a water hose seems to be the winning solution. I've done it twice now and it seems rather effective. 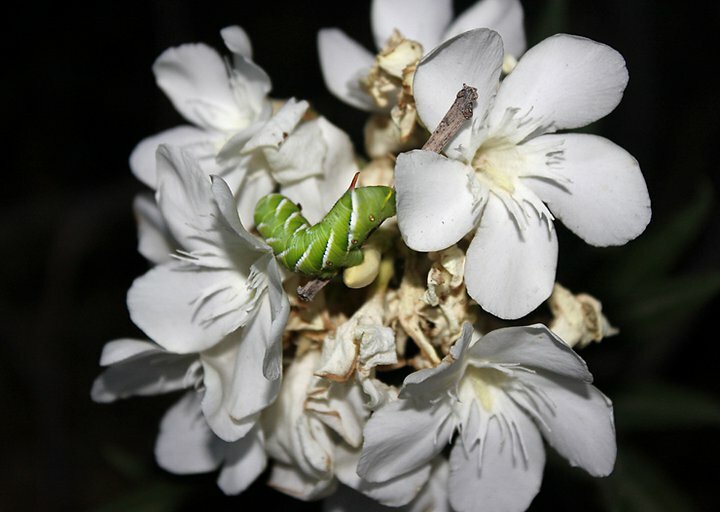 Since oleander does not need to be regularly watered to survive, not watering the plant at all is a slow way to deter the bugs. Good old pesticide isn't necessary unless you have a serious infestation. Avoid spraying in direct summer sun, because the leaves could burn. I always suggest a milder alternative like soap or oils like neem. 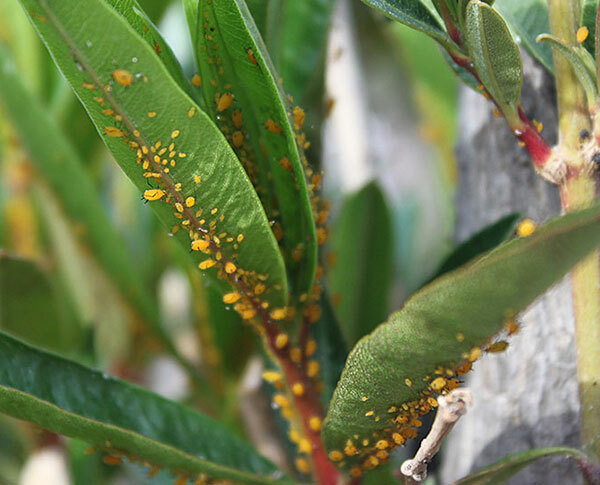 Aphids are soft bodied and are easily effected by these gentler solutions. Introducing other bugs such as lacewings, butterflies, and lady bugs is a good possible solution. 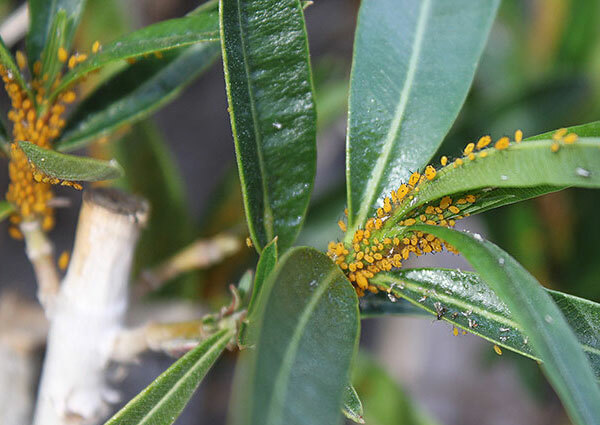 Lady bugs love aphids and you can order them online. You'll have to do more research on this as introducing anything to your ecosystem can have unexpected results. The most common issue is introducing a bug with a disease that infects the same bugs that already live in your yard. Look locally and make sure it's necessary. For more serious results, you can prune the infected areas and dispose of them in tight plastic bags or burn them. Please keep in mind that burning oleander will emit a toxic essence into the air that can cause serious illness if inhaled. If you choose to burn oleander, make sure you do so in a non populated area. Deter them with other plants by neighboring them up with the likes of onions or marigolds. This well camouflaged worm will nom all your plants to death. 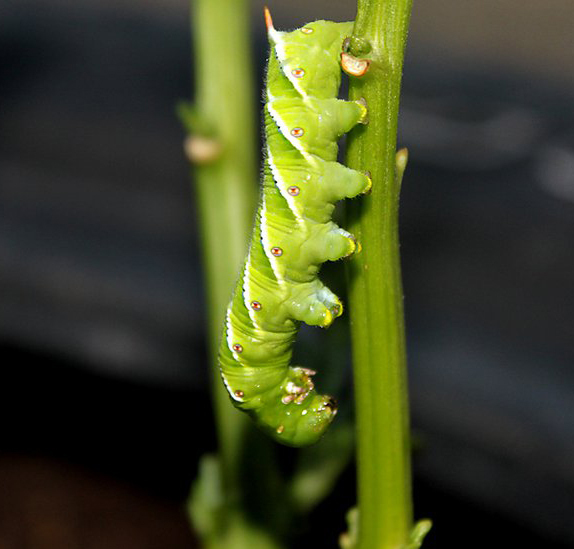 This vile little creature can destroy your plant in one or two days! It may have had an accomplice, but I never saw a side kick. The victim: my poor pepper plant. I had two red bell pepper plants growing. These two plants were my first true experiment growing food in the desert. I kept them outside because I figured peppers loved the heat. I watered and check on them every day. I saw 3 peppers starting, I was so excited to see them. One day, I went out to check on them, and half of the leaves were gone! I searched the plant and figured that maybe birds had eaten the leaves as I saw no pesky, leaf munching critters. The next day, my plant had only a few leaves left, and the other plant was missing leaves too! It wasn't until there were too few leaves to hide it, that I saw this critter. It was the same color as the plant and hard to see. I poked it with a stick. It's a very slow creature, and it looked so neat that I used a stick to pick it up and place it on a flower for a picture. Shortly, after I backed away from the Oleander flowers that I placed it on, a bird flew in and nabbed the worm! I guess that's why it's colored the same green as the leaves it hides in. It must be tasty. My pepper plants didn't survive. With so many leaves eaten so quickly, they just couldn't obtain enough sunlight to repair themselves. No photosynthesis for you! I was called this 'bug' a catepillar for awhile. I posted the photos of it on Facebook and was quickly corrected that this was the dreaded Horned Tomato worm, killer plants, destoyer of nations, stomper of hearts. I know to look for you now, you little heathen!